People are always talking about how important it is to keep the reader interested. Retain their interest. Keep them turning pages all the way until the end. One way to do this, I keep hearing, is though the cliffhanger chapter ending. But no one ever tells you HOW to write the cliffhanger effectively. My biggest question: If you don’t end your chapter at the end of your scene, how DO you end your scene? Well, I’m happy to welcome Rebecca Belliston, who’s here to answer that question and offer some advice on how to write cliffhanger endings well. One of the best things an author can hear from a reader is, “I’m so exhausted. I stayed up until four in the morning to finish your book.” And then they go on to complain about how they’re going to fall asleep in class or at an important meeting. When this happens to me, I swallow a grin and say, “Oh, I’m sorry I kept you up so late.” But really, I’m not sorry. Not at all. Because if they were willing to give up sleep, they must have really liked the book. Often writers are told to work on the hook of their story, making readers interested in the characters and setting within the first page or two. And while that’s important (and extremely daunting), it’s equally important to keep the reader reading all the way until THE END. Because, let’s face it. We’ve all started books we’ve never finished. Heaven forbid our readers do that with our masterpieces, right? End chapters with a cliffhanger as often as possible. Think about TV shows, especially dramas. They cut to commercial at the height of the scene’s intensity, not at its resolution. Even in reality shows, the music builds to a dramatic swell and then, BAM! You’re watching a Geico commercial. They do that so you don’t leave. So you don’t get distracted grabbing Oreos and a glass of milk during those two minutes and forget to come back. But as authors, we’re tempted to stop chapters when the conversation winds down or the conflict is resolved—basically, at the end of the scene. It’s a natural break in the story, so it seems like a sensible place to end the chapter. However, if we end every chapter with a resolved scene, readers might leave for those Oreos and find something else to do. When it comes to holding reader interest, knowing when to end a chapter matters almost as much as knowing what content to include within the chapter. “Effie Trinket crosses back to the podium, smoothes the slip of paper, and reads out the name in a clear voice. And it’s not me. Now, would you stop there to go get a treat? To sleep? No way. You’d fly through the pages, hardly even noticing the chapter breaks because the story was flowing so seamlessly. So How Do You End Scenes Without Using Chapter Breaks? For example, end the chapter with Humpty Dumpty in the act of falling off the wall, so the reader has to start a new chapter to find out what happens. The next chapter begins with him broken on the ground, helpless. A little later in the chapter, when you need to end the scene and switch to the POV of the kings’ men, do a little *** to make the jump. Readers are less likely to put down a book after this kind of break because it’s softer than a chapter break. They also don’t have to physically turn the page to move on to the next scene; the rest of the text is right there on the same page, enticing them to continue reading. 2) Use a simple transition sentence to change scenes. 3) If you do need to end a scene at the end of the chapter, leave something unresolved— something in the air that’s big enough to make the reader turn the page. Chances are that if you’re aware that you need to leave something hanging, you’ve found a possible spot to end the scene. Use these techniques and you’ll greatly reduce the number of bookmark-able places in your story. Watch TV shows and read books to see how it’s done. The more you practice writing chapter and scene endings this way, the more natural it will feel to leave your readers hanging and begging for more. 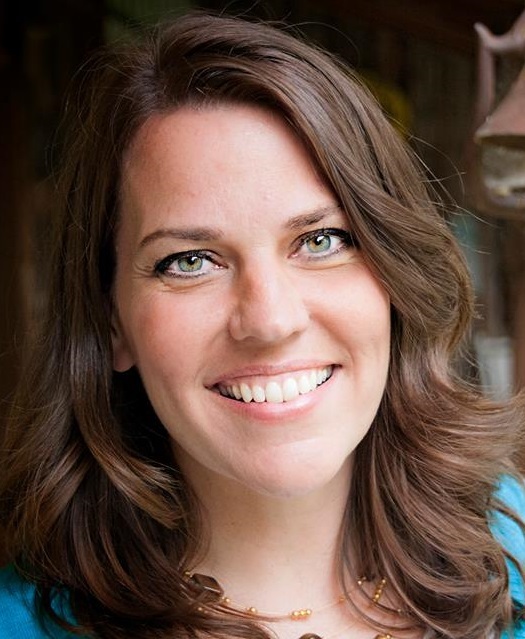 Rebecca Lund Belliston is the bestselling author of the Citizens of Logan Pond dystopian trilogy and the LDS romantic suspense novels, Sadie and Augustina. She’s a sucker for a good romance, a good clean romance, and as such she layers her stories with page-turning romance and heart-pounding adventure. She’s also the bestselling composer of religious and classical-style music that has been performed around the world. When she’s not writing fiction or music or chasing her kids, she loves to cuddle up with a good book. She and her husband live in beautiful Michigan with their five kids. Connect with her on Twitter and discover her books here. This entry was posted in Endings, Guest Post, Story Structure, Uncategorized, Writing Craft, Writing Lessons. Bookmark the permalink. Outstanding advice for chapter endings, and beginnings. I can’t wait to use this information to make readers not be able to set down my next book! “Leave something unresolved.” I can remember that! Great advice!! I’ll have to remember this while I’m revising. You always write great posts, Rebecca. This is an area I struggle with, so thanks for the tips and helpful reminder for when I write. Thanks, Charissa! It’s something I have to be consciously aware of or my endings grow dull. Good luck! This is definitely something I have to do on the rewrite, but nice advice here. I have an editor who is good at pointing out when I FAIL to do this, so that helps. But it is nice to know how to be proactive. I focus on this during my rewrites. That’s great that you have an editor who can help you see some of your blind spots. That always helps. Happy writing! Very good and useful information. You’ve given me food for thought so I’m going back to check my scenes and chapters and see how I can improve them using the information you have shared. Thank you. I agree! I just read a chapter today, in fact, that ended with a character refraining from answering his friend. He just smiled a sly smile. The answer becomes obvious in the next chapter, but it was a clever way to keep the reader turning the pages. So often it can be subtle. S.J. has a point about cliffhangers being artificial constructs. I think cliffhangers are often listed as one of the things for writers to avoid doing. I hate when a writer ends a chapter with the jury foreman standing up to announce the verdict and then says nothing. I feel tricked. It seems to me the ending of a chapter is more about suspense and tension of the unresolved, as you point out. This is an interesting discussion, because I can see validity on both sides. Which doesn’t typically happen for me ;). I agree that cliffhangers, if overused, will definitely become contrived and forced. But for some genres, cliffhangers fit very well. Thrillers and suspense stories naturally have more opportunities for them, so it makes sense that there’s going to be more in those kinds of books. Literary fiction, not so much ;). And yet, if it fits, you can find them there, too. If the writer doesn’t know how to make a compelling scene that makes the reader want to turn the page using all the other techniques at hand, breaking the scene in the middle and ending with a cliffhanger will not save the story from being the best it can be, in my opinion, and may even prevent the writer from making the story better. Yes, TV series use cliffhangers all the time because of commercial breaks and the many competing TV programs available during those breaks, but not because of the unwashed dishes in the sink or undone household chores. With the odd exception, e.g., THE HUNGER GAMES, and wearing my hat as a former editor and lifetime reader, manuscripts that used cliffhangers went into File 13, and published books that use them often get a pass from me, too, unless the work in both cases demonstrates that the author didn’t really need the cliffhangers to keep me interested. Thanks for chiming in, SJ. It’s true that no matter how tantalizing the end of the chapter is, if what’s in between isn’t written well, I’m not going to keep reading. I’m a little loopy this morning because I was up too late last night reading The Knife Of Never Letting Go. The earlier chapters had no cliffhangers and I breezed through them because the voice was so engaging, and the scenario was so interesting. But then, right around my normal bedtime, the cliffhangers started kicking in. I read much farther than I typically would have simply because I had to turn the page. This morning, as a result: YAWN. :) As with any technique, the cliffhanger ending isn’t going to resonate with every reader (or editor, for that matter). But I do believe it can be used effectively—if it’s written well. Hopefully these tips will help. Hi SJ, I agree that cliffhangers should never replace great scenes or writing! And different genres will use this technique differently. Authors should just be careful in resolving issues with the end of the chapter (current problem solved). I catch myself doing it all the time because it feels like a natural breaking point, but my writing is better when I’m deliberate and aware of breaks. I love keeping the reader guessing and anxious. As with all writing techniques, it takes practice and can become cliche if done poorly or conspicuously. Thanks for your thoughts! This is the best explanation I’ve seen for how to do a cliffhanger. And it makes it simpler than I’d been thinking. Hi Ann, glad they could help. 🙂 Happy writing!